Several folks have written in asking if I knew of any reason why the comments section of the blog is no longer accessible within the CJC at Harris County computers. I've heard varying accounts from people not being able to post comments to people not being able to read them. Some asked me if I had done anything to the comments by changing something on my blog settings, but I had not. Most surmised that Lykos and the Gang Who Couldn't Shoot Straight had something to do with it. Well, surprise surprise, if you guessed Lykos and Crew as the culprit, you solved the mystery before I did. Apparently Lykos ordered her tech guys to have ITC disable the comments section on all county computers. I presume that applies to everyone in the courthouse, since I don't see if they could do it only for the District Attorney's Office computers. I wonder whether or not Lykos ran that by Alex Bunin at the P.D. 's Office or any of the 37 judges who might actually enjoy reading how things are going at the D.A. 's Office. Well, I have to admit that I'm flattered to be joining the ranks of the banned, along with Mark Twain, J.D. Salinger, William Faulkner, Joseph Heller and Luther Campbell. Just kidding. I have nowhere near the writing talents of Luther Campbell. 1. They have these thingies called "Smart Phones" now. Whether it be a Blackberry or an iPhone or a Droid, they can ALL browse the Internet. All of them. 2. While browsing the Internet, they can also leave comments about how their technologically-stunted boss is a terrible District Attorney who is now being investigated by a Grand Jury. 3. Every last one of your employees knows that you are a paranoid megalomaniac and none of them are stupid enough to type something bad about you from an Office computer. They will wait until they get home before they do that on their home computers. You can't track them and monitor their thoughts there. 4. Most of the comments are coming from your own people anyway. You shouldn't be worried about what they are reading. You should be worried about what they are thinking and writing. 5. It isn't the folks inside your office that you need to worry about finding out what a group of morons you and Leitner and crew are. Trust me, they've known that for years. I'm willing to bet that if the 2012 election was held just by your own employees, you'd lose in a landslide. It is the folks on the outside of the Office that you should be afraid of learning about your antics. They, for some reason, seem to embrace your dishonesty and bullying. Sadly, once again, the depths of Lykos' stupidity never cease to amaze me. Black Ink has a new post on his blog worth reading. It is as sobering as it is accurate. I have no idea whether or not Kelly will run again, but if she does, Black Ink has a pretty clear picture of what she'll have to go through. That's Pat Lykos Politics and it is very disheartening to read. If Kelly does run, she'll have my whole-hearted support. If she doesn't . . . hell, who could blame her? As most of you all know by now, yesterday it was officially announced that Judge Susan Brown appointed Stephen St. Martin and Jim Mount as Special Prosecutors for the 185th Grand Jury. In light of the events of the past week, it isn't too surprising of a development. I know Stephen very well because he was my former Chief when I was in the 174th. If you read this blog, you know that I think extremely highly of him. He was highly respected when he was at the District Attorney's Office before leaving in May of 2009. He worked on high profile cases and was a Special Crimes prosecutor. He has the highest integrity and I think the General Public can rely on both him and Jim Mount to uncover any illegal acts done by the District Attorney's Office without going on a witch hunt to drum up something if there isn't anything actually there. I don't know Jim Mount nearly as well. He was long gone from the District Attorney's Office when I started there in 1999. I know that he was well-liked and respected as a prosecutor. I dealt with him some when I was a new prosecutor and he was a defense attorney, and he was always very kind to me. I'm sure that he will do a great job as well. The accusations against Lykos are extremely serious because they involve the widespread prosecution of members of our community for DWI with faulty evidence that the prosecutors knew was faulty. Furthermore, they retaliated against the person who tried to bring it to light, and then tried to bully their way into the Grand Jury to make sure the investigation was going their way. Folks, this stuff is serious. As the Grand Jury investigation begins today with its new Special Prosecutors, Life is going on at the Harris County Criminal Justice Center. Despite the fact that the elected District Attorney herself said she has no faith in HPD (before hopping on a plane to Hawaii where she'll learn how to prosecute drug cases in the event she ever decides to try a case), a DWI case with B.A.T. van involvement is going to trial in Court Four. And yes, the filing deadline for District Attorney is rapidly approaching. Things haven't been quite this crazy around the CJC since, oh, December of 2007. I finally found a use for my History major in a new article on the Chronicle blog. You can check it out by clicking here. Looks like the 185th Grand Jury is not letting go of their investigation any time soon. Today, multiple subpoenas went out to both current and former-Harris County Assistant District Attorneys, ordering their appearance before the Grand Jury. Yes, I do have the names of who got subpoenaed, but I'm not publishing them. If you name them in the comments, I'm not publishing them, either. It is worth pointing out that just because they were subpoenaed in no way means that they are targets of the investigation. But the information they may or may not have could prove to be very interesting. I do hope that those ADAs who are getting subpoenaed know better than to rely on HCDA General Counsel to represent them. Lykos and her Gang don't exactly have the best track record of standing by their people if it conflicts with their own interests. More from the BAT van/Grand Jury scandal. Just a couple of thoughts on the mechanics of an investigative Grand Jury. You can get there by clicking here. On Wednesday, October 19th, the 14th Court of Appeals denied a Motion that Harris County District Attorney Pat Lykos hopes to God that you don't pay attention to. However, if you simply must look at it, I suppose you can get to the decision by clicking here. The case is styled "In Re the State of Texas, Ex Rel. Patricia R. Lykos v. Hon. Susan Brown, Presiding Judge, 185th District Court of Texas" and is filed as "Request for Emergency Stay of Grand Jury Proceedings." Sound interesting? Well, it is. Very interesting. By reading the District Attorney's Office "request" and the supporting memorandums of HCDA General Counsel John Barnhill and Grand Jury Division Chief Carl Hobbs, a very clear picture of Lykos' attempt to extract vengeance against Amanda Culbertson emerges. First, a little background. As I talked about in this post earlier this month, the District Attorney's Office is very very upset with former-HPD technical supervisor, Amanda Culbertson. Ms. Culbertson used to be in charge of making sure that the Intoxilyzers over at HPD were all in credible, working order. We don't want an Intoxilyzer showing your breath test results as a .14 when really you were a .07, do we? Ms. Culbertson had some issues with the HPD Mobile "B.A.T." vans that had portable Intoxilyzers in them. She thought the conditions the B.A.T. van Intoxilyzers were being stored in could affect their reliability. She told her supervisors. Her supervisors didn't care. She quit HPD and went to work for Lone Star College, doing the same technical supervising, but now for County Law Enforcement Agencies. Culbertson let people know that she left HPD because of her issues with the B.A.T. vans, and that put all of the District Attorney's DWI cases that involved those vans in serious jeopardy. That made Pat Lykos angry. She got the Commissioners Court to cancel the contract with Lone Star College so that the District Attorney's Office would never ever ever have to deal with that damn Amanda Culbertson again. Did that satisfy Pat Lykos? Nope. She wants Amanda Culbertson indicted, too. Amanda seems to have pissed off Lykos in a way that even I have failed to do in my three and a half years of blogging! Which brings us to the 14th Court of Appeals filing. Lykos is having her prosecutors present a case to the Grand Jury involving the B.A.T. vans and Amanda Culbertson. 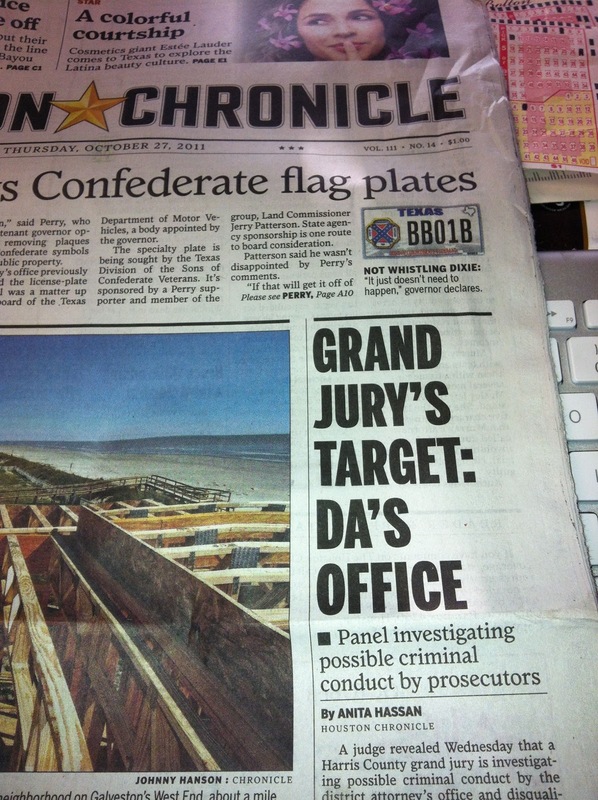 That Grand Jury was created by the 185th District Court, Judge Susan Brown presiding. Grand Jury proceedings are secret, so we don't know what exactly has been presented to the Grand Jury so far. But on October 18th, the Harris County District Attorney's Office vendetta against Amanda Culbertson blew up in their face. On that day, prosecutors Carl Hobbs, Steve Morris (from Governmental Integrity), and John Barnhill all marched down to the 185th Grand Jury with the intent of calling defense attorney (and former-prosecutor) Brent Mayr as a witness before the grand jurors. Brent Mayr, if you will recall from my earlier post, is the attorney who filed a Writ against the D.A. 's Office for withholding evidence of B.A.T. van reliability issues. Upon arrival at the Grand Jury, however, Hobbs, Morris, and Barnhill were suddenly informed by the Grand Jury bailiffs that the Grand Jurors wanted them (the prosecutors) excluded from the room while Mayr was testifying. In legal terms, the proper response to this is "Holy Catfish, Batman." Prosecutors are always in the room with Grand Jurors when they are interviewing witnesses. 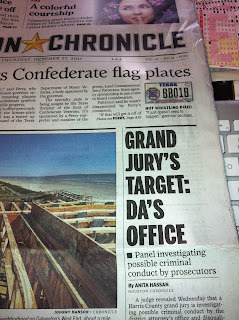 The only part they are excluded from in a Grand Jury is when the grand jurors deliberate. The Grand Jurors excluding the prosecutors from the testimony is kind of the equivalent of the President being booted out of a Cabinet meeting. It just doesn't happen. I mean, ever. Hobbs, Morris and Barnhill were incensed, obviously. Hobbs and Barnhill quickly gathered up 1st Assistant Jim Leitner and stormed up to Judge Susan Brown's court to demand that she order the Grand Jury to let them back into the room while Mayr testified. Judge Brown politely declined to order the Grand Jury to do anything. Thus, the Motion (or Request) to the 14th Court of Appeals that would make the Court of Appeals order Judge Brown to order the Grand Jurors to let the prosecutors in the room. To realize that significance of this, you have to read between the lines (but just a little bit). The 185th Grand Jury has quite apparently decided that the Harris County District Attorney's Office's involvement into the crucifixion of Amanda Culbertson B.A.T. Van investigation is suspect, if not entirely improper. They don't want them in the room while hearing from witnesses. And that has got Hobbs, Barnhill, Leitner, and Pat Lykos scared. Really scared. So scared that they are scrambling very quickly to Judge Brown or the 14th Court of Appeals to demand that they get to jump in and stop whatever is going on. Seriously. Go read Barnhill and Hobbs' memorandums to the 14th Court of Appeals. Just prior to being escorted out of the grand jury room by the bailiff, I observed the bailiff in her office and overheard the bailiff speaking in a telephone conversation. The bailiff said to the person on the phone, "They told me to arrest the DAs." From that, I assumed that the grand jury had instructed the bailiffs to arrest Mr. Hobbs, Mr. Morris and me if we remained in the grand jury room while the grand jury was attempting to question the witness. The implication being that the 185th Grand Jury may have started their own investigation, and it ain't into Amanda Culbertson. It may just be into Pat Lykos and the Harris County District Attorney's Office. Remember back in that last post when I said this may just be the tip of the iceberg? I hate to say "I told you so," but . . . Wait, no I don't. I told you so. Watch for this story to get a lot bigger in the days to come. UPDATE: Ted Oberg did a great piece on the Grand Jury Scandal. Check it out by clicking here. When Pat Lykos took over as D.A. of Harris County on January 1, 2009, she spent a lot of time garnering praise for herself by taking previously existing D.A. divisions, renaming them, and then claiming to have invented them. One of the few things that she did actually create on her own was a Division (consisting of one person -- Russell Turbeville) that would be dealing with Cold Cases. Don't get too fired up. The Division wasn't as exciting as it sounds. What they were really doing was looking up previously filed cases where an arrest had not been made (although the crime had been solved enough to have charges brought). This Division basically just sees if they can get some movement from the involved police agencies to actually go arrest the accused folks on already existing warrants. Although Lykos may take credit it for it, she ain't gonna be solving the Kennedy Assassination any time soon through this Division. But this was an idea that Lykos got from Bill Exley's suggestion back when she first took office on 1/1/09. It looks like she is stalling out in her campaign for attention, because apparently she decided to call in the news media to announce that she was creating it again. It was a bold move by Lykos, who had not "created" this Division in over two and a half years since she last created it. A bonus to her was that the article announces that she is going to "solve" crimes and it gives her the opportunity to talk about how awesome she is. Speaking of solving crimes, how is the Gang that Couldn't Shoot Straight doing on that whole "bullying investigation" that they were working on? Solved it yet? Recent Harris County District Attorney's Office graduate and future-Public Defender's Office attorney Scott Pope has recently started a new blog worth checking out. There's a good article from Lisa Falkenberg in today's print edition of the Chronicle regarding the ongoing dispute between the Harris County District Attorney's Office and Amanda Culbertson, formerly of the HPD Crime Lab. I will link to it when it comes online. The long-story-short is that Harris County has apparently had a contract for twenty years with Lone Star College for the testing and maintenance of the instruments used to test breath test results. Earlier this year, Amanda Culbertson told officials that the Mobile "B.A.T. vans" that have intoxilyzers in them were not reliable, thus jeopardizing numerous DWI cases where they were used. Her findings were documented in e-mails within HPD, and defense counsel Brent Mayr had filed a Writ in March of this year alleging Brady violations for withholding that information. Fast forward to July, when defense attorneys Dane Johnson and Jordan Lewis find themselves in trial on another B.A.T. van case, where a trial case had to be continued mid-trial when prosecutors claim that this is the first time they've heard of these allegations. As noted in the article by the Chronicle's Brian Rogers and Anita Hassan, Amanda Culbertson stated she left the HPD Crime Lab over her reports of the B.A.T. van problems and moved to Lone Star College, where she continued in her duties for a different agency. Rather than being the chemist for HPD, she is now doing it for Lone Star, which does the supervising of those intoxilyzers used by the Harris County Sheriff's Office and other county agencies. Apparently incensed that Culbertson had called into question the H.P.D. cases, the County is now trying to suddenly cancel that contract with Lone Star. You can draw your own conclusions as to whether or not that move was in response to their new employee -- Amanda Culbertson. As Lisa points out in the article, Lykos and Crew over at the D.A. 's Office are attempting to play the "who me?" card on what has inspired the termination of the contract, acting as if this was a move made by County Commissioners without the Office's involvement. However, this seems to fly in the face of logic under the circumstances. At the last Commissioners' Court meeting on the subject, ADA Rachel Palmer, who is the Deputy Chief of the Misdemeanor Division (which handles the vast majority of DWI cases for the Office) was in attendance when the matter was addressed. To top things off, there have been rumblings and threats from the D.A. 's Office about looking into whether or not they could indict Culbertson for perjury. Lisa's column is a great one, but I think we are just hitting the tip of the iceberg when it comes to this story. Sound a little retaliatory yet? My friend and fellow blogger, Paul Kennedy, pointed out yesterday in his blog that he was somewhat perturbed at the rush to defend Amanda Culbertson and other members of Lone Star College by the defense bar, arguing that it gave them credibility on future cases in advance. I understand his position, but I think at some point there may need to be a weighing of the evils involved here. Defense attorneys standing up for a whistleblower witness that is risking her livelihood to testify about faulty evidence that affects hundreds of cases is the right thing to do, even if it means having to begrudgingly admit that you find her credible down the road. The dangers of a District Attorney's Office that will literally go after that same whistleblowing witness like John Gotti after Sammy "the Bull" Gravano is a much more alarming proposition, in my opinion.